Two people escaped a fire that ripped through an Elm Street duplex in the village of Granville Monday, officials said. 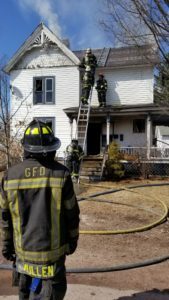 Fire and EMS crews were called to 7 Elm St. for a reported structure fire at 1:55 p.m. on April 2. “At the time, there were two people inside of the building,” said Ryan Pedone, chief of the Engine and Hose Fire Co. He said the downstairs tenants noticed the smoke and, at first, thought it was steam from the shower. “They were startled by glass breaking and smoke filling the house, that’s when they realized there was a fire and called 911,” he said. The fire started in the rear corner of the house and was of an “accidental nature,” Pedone said. Seven people were displaced as a result. “It’s a total loss,” he said, noting that there was one child’s bedroom that was spared from fire and water. The property is owned by James Covino, of Granville. He leases the two apartments inside.